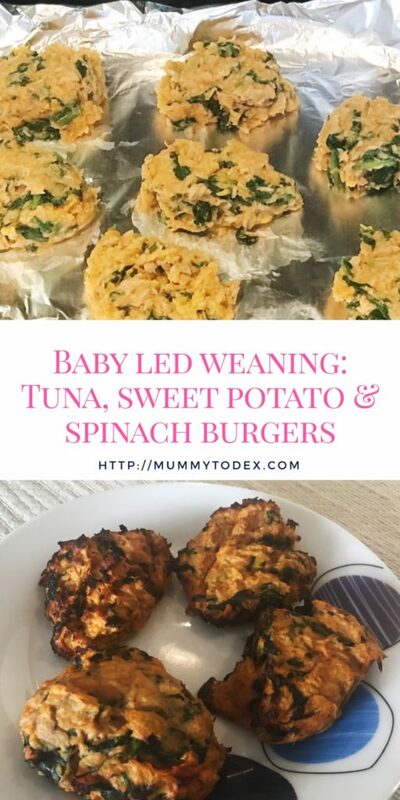 I think our baby led weaning sweet potato and spinach burger recipe has to be the most viewed page on our blog of all time and considering how popular it is on Pinterest it will continue to be for many years to come. As you know, I am always looking to create new recipes in the kitchen so I thought I’d do a little twist on the vegetarian sweet potato and spinach burger and add a little tuna. Dexter is now 23 months old so kind of past the baby led weaning stage, but he still loves eating finger foods and loves things like burgers, nuggets and pizza; all unhealthy stuff that I try to make as healthy as possible in the kitchen. These tuna, sweet potato and spinach burgers incorporate so many healthy nutrients and I am more than happy for him to have as many as his heart desires. The burgers are pretty simple to make, cook quickly and are able to be stored in the fridge or freezer if you want to batch cook a few. I highly recommend only keeping them for three days in the fridge and fully defrosting them before eating them if you decide to freeze them. I hope you enjoy this recipe as much as Dex did. As always if you have any comments or questions, please feel free to share them in the box below and if you think someone else would love this baby led weaning recipe, please be sure to share it on Pinterest. You can follow me on Pinterest here to see more of my baby led weaning recipes. New to baby led weaning? Make sure you read my post on baby led weaning concerns. Cook the sweet potato either in microwave or oven, or if you are lazy like me, buy frozen diced sweet potato and steam it or boil it gently for ten minutes. While the sweet potato is cooking, wilt the spinach by frying gently in some oil or garlic or by pouring boiling water over it, then squeezing out the water. Mash the cooked sweet potato and add the canned tuna. Mix well. Add an egg and combine thoroughly. Prepare a baking tray by lining it with foil and spraying oil where your patties will go. Using a table spoon, spoon some mixture and roll into a ball. Place on the baking tray and then lightly press down on the ball with the back of your spoon so a burger shape is formed. Repeat until all of the patties are made. Bake in the oven at 180C for fifteen minutes until browned. These look yum – I’m always looking for ways to get more meat and fish into the toddler’s diet so will definitely be trying these, every time I’ve tried tuna before he’s just screwed his nose up!! I followed your recepie however had a problem to take burgers of the foil. Any thoughts why was that? Great recipe! Have you actually tried freezing these? Do they turn out ok after defrosting? Would you freeze these ?